The Army Air Forces Combat Weekly Digests 16-20 WWII DVD contains five films of weekly air combat updates from the European, Pacific, and CBI Theaters. Film #1 - Combat Weekly Digest 16: 7 February 1944 - Convoy to Bougainville, 200th mission over Italy, Rescued nurses return to Bari, Italy from Yugoslavia, Bombing of Thailand and Bombing of Jap occupied China. Film #2 - Combat Weekly Digest 17: 14 February 1944 - New Guinea air depot, Emergency airfield England, Supplies start for China, Bombing of Jap occupied China, Bombing of Rome. Film #3 - Combat Weekly Digest 18: 21 February 1944 - Preparing supplies for parachute delivery, SS MacArthur aground, Return from 200th mission San Pancraczio Italy, Bombing of Burma, Japs raid air bases at Kunming. 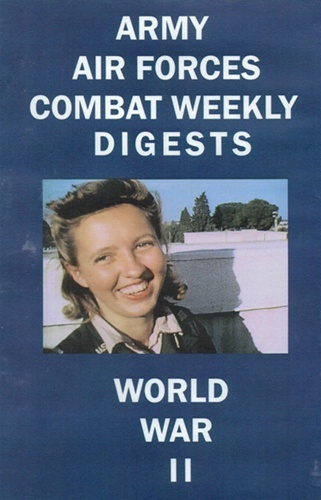 Film #4 - Combat Weekly Digest 19: 28 February 1944 - Supplies for China by air, Bombing of Buka Passage Bougainville, Servicing an A-36, New Caledonia holiday, Church services for outposts Bougainville, Low altitude bombing raids by French A-20s. Film #5 - Combat Weekly Digest 20: 6 March 1944 - Burmese outposts supplied by parachute, Japs raid Dinjan India Airdrome, Evacuation of casualties, Burma, Raid on Formosa, Soldiers bonus, Americans land on New Britain. Total run time for Army Air Forces Combat Weekly Digests 16-20 WWII DVD is 1 hour, 42 minutes in B&W. Format is NTSC DVD.